LAWRENCE — Biological field stations at the University of Kansas and Kansas State University soon will be part of one of the most extensive long-term initiatives in the history of the National Science Foundation. The NSF-funded National Ecological Observatory Network, or NEON, will gather data on the causes and consequences of climate change, land use change and invasive species. The project will span a 30-year period, officially beginning in 2017, monitoring sites across the U.S., from Alaska to Hawaii and Puerto Rico. Monitoring towers equipped with environmental sensors are being installed this fall at KU, and K-State field sites are expected to be drawing provisional data by spring 2015. NEON moved through the concept, approval and design stage from 2006 through 2012. Since 2012, it has been building monitoring sites, with some already streaming provisional data. To choose monitoring sites representing the full range of U.S. ecological and climate diversity, scientists working with NEON used an algorithmic process to divide the country into 20 eco-climatic domains, including the Prairie Peninsula— also known as Domain 06 — that were very different from one another. Each domain represents distinct landforms, vegetation types, climates and ecosystem processes. Every domain will have three key sites, including one “core” site. The monitoring tower at each core site will be permanent and is to remain in place for at least the 30-year period. The other two sites, known as relocatable sites, will each have a tower in place for five to 10 years, after which the towers may be moved or remain in place. In the Prairie Peninsula, the core site is at the 8,600-acre Konza Prairie, which is jointly owned by The Nature Conservancy and K-State and managed by the K-State Division of Biology. A relocatable site is also at Konza. The other relocatable site is at the KU Field Station’s primary research area, about 1,800 contiguous acres north of Lawrence. This area is held by the KU Endowment Association and managed by the Kansas Biological Survey at KU. Monitoring at each of NEON’s 20 domains will be overseen by a resident field operations manager. Jennifer Smith, manager in the Prairie Peninsula domain, arrived in Manhattan, Kansas, this fall from Missoula, Montana. Smith recently completed a doctorate in organismal biology and ecology from the University of Montana, where she did research in the state’s intermountain grasslands. Before beginning graduate work, she was involved in ecological research with the University of Montana, the U.S. Forest Service and the U.S. Geological Survey. Smith will manage all field personnel and logistics for data sampling in Domain 06. Each tower site will include a variety of environmental sensors on the tower and in the soil. Seasonal field crews will collect samples at the monitoring sites, including small mammals; beetles, mosquitoes and ticks; plants; and soil. An airplane equipped with a remote sensing platform will fly over sites annually to collect aerial data. All NEON data and information products will be free and openly available in near real-time to scientists, educators, students, decision-makers and the public. Its infrastructure can be used as a baseline for long-term ecological studies. NEON also will provide educational resources and citizen science programs. Konza was chosen as a core site because of its representative vegetation and existing historical data available from past research there, said Jeff Taylor, NEON assistant director for biometeorology. John Blair, University Distinguished Professor at K-State and principal investigator of the Konza Prairie Long-Term Ecological Research program, said NEON would provide state-of-the-art instrumentation for measuring ecological processes and environmental change — complementing more than 30 years of experiments and measurements at Konza as part of the NSF-funded LTER program. “The co-location of NEON infrastructure and the Konza LTER program also will provide unique research and training opportunities for students and scientists at institutions throughout Kansas and beyond,” Blair said. The KU Field Station was chosen by NEON as a monitoring site because of its transitional nature. The Field Station, which spans four sites in eastern Kansas, is located within the prairie-forest ecotone, or transition zone, of the continental U.S. The effects of specific land management practices have been a subject of decades-long research at the Field Station. 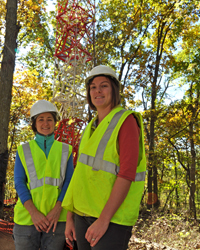 Pictured above: Jennifer Smith (right), field operations manager for NEON Domain 06, and Nicole Stanton, botanist for Domain 06, visit the NEON tower site at the KU Field Station just north of Lawrence.